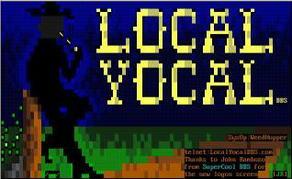 Interested in checking out fully animated old school ANSI games with sound? Come by and check out fully animated boxing in Top Rank Boxing. Like card games? Check out fully animated Acey-Deucy. There is also fully animated Drag Racing, Saratoga horse racing and more! can use the ftelnet client, located at http://localyocalbbs.com. art work as well as quality play. This entry was posted in BBS - Synchronet and tagged American National Standards Institute, Animation, bbs, Bulletin board system, Card game, Clients, Drag racing, Telnet, United States. Bookmark the permalink.